We need a new term for that. How about "niphaplaning"? You want to install the rear tire according to the direction of arrow: better grip for propelsion. You want to install the front tire opposite direction of arrow: better grip for braking. Hydroplaning, wasn’t what I was alluding to. Water dispersion, was. There’s a reason why the tread is made with the pattern it has. 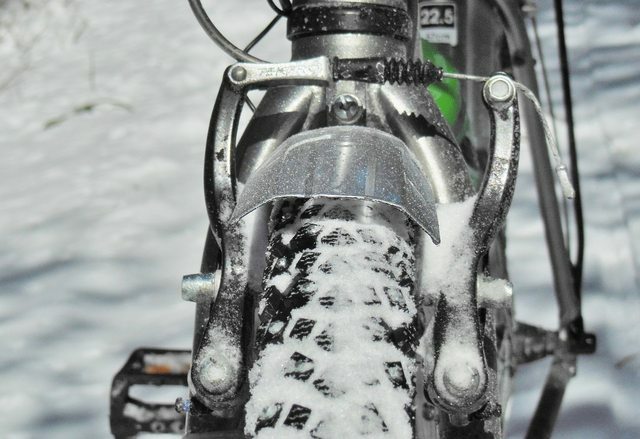 The knobby on the mtb tires say your theory is not correct. Lots of unnecessarily detailed analysis on this thread. For road tires in the majority of conditions, whether a tire has tread or not matters very little in terms of wet or dry traction. Rubber compound, suppleness, TPI, pressure and width are all significantly more important. Apart from looking at the tires, most road riders would never know the difference if their high end tires were installed backwards or if they had tread or not. Some are also conflating tread with knobbies. They are not the same. Both tread and knobbies are designed to increase traction but tread is designed to do so by removing water from between a tire and a hard surface while knobbies are designed to prevent shear between a tire and loose or semi-solid surfaces. Knobbies can sometimes function like tread and tread can sometimes function like knobbies but they are not the same and are designed for two completely different use cases. HaHa! That's never happened before on BF !!! There's no horse dead enough on internet forums that it can't be beat a time or two more! Exactly. Water dispersion, as I said. I rode for years with labels to the left as I always leaned the bike right-side to against walls. A couple of years ago I went back to labels on the right convention. I have yet to notice any difference riding in Portland, OR. Actually that makes sense. I gave water displacement zero thought. In line with my theory that weight only hurts when you know about it. Water dispersion is completely irrelevant for 23 or 25 mm road tires. Maybe Jobst Brant or someone like that could tell but 99.999% of the rest of us would not know the difference between road tires with and without tread if we could not see what was on the bike, even in heavy rain. I gave water displacement zero thought. Others on this thread should take your example. It is literally a non-issue for normal road bike tires. It just has to look right in my eyes, whether or not a bike tire sheds water, or if only the pros have the skill to make them shed water. The tread matters on cars and motorbikes, so it matters to me on bicycles. I've ridden many bikes with many tires, they all pick up water. Maybe it's all bullspit and Vs down just makes a bike look faster. Maybe so on 23 or 25 tires (that look completely slick, and only with a magnifying glass can you see any grooves. LOL). I'm talking about tires that have distinctive tread patterns such as the 28 Schwalbe Marathons I have on my hybrid. Again, there's a good reason why they have tread patterns. Put them on incorrectly and watch what happens when the tire rolls backwards through heavy water on pavement at speed. I have turned 25c Paselas around many times and never saw the difference. Mid-ride. In the rain. Both tread and knobbies are designed to increase traction but tread is designed to do so by removing water from between a tire and a hard surface while knobbies are designed to prevent shear between a tire and loose or semi-solid surfaces. In the context of tires, the word "tread" usually refers generally to the part of a tire that makes contact with the riding surface. Even smooth slicks have tread, in this sense. Sometimes the word also gets used as a catch-all phrase for non-smooth tread patterns... I'm unfamiliar with it being used to specifically refer to water-shedding patterns. Maybe that's a regional thing? The argument I see sometimes is that road tires should have very shallow fine patterns - such as the herringbone on the sides of many tires, or the small dots that Paves have at their centerline - to mechanically interfere with road irregularities. The idea being better behavior in wet conditions when the coefficient of friction is much lower.